Britain's WBA lightweight champion Anthony Crolla believes he had a "responsibility" to defend his title against Ismael Barroso on Saturday. Crolla faces the unbeaten Venezuelan at the Manchester Arena in the first mandatory defence of his title. Barroso, 33, secured the 18th knockout victory of his 21-fight career when he stopped Kevin Mitchell in the fifth round at London's O2 Arena in December. "There was no way I was going to swerve Barroso," said Crolla, 29. "I'll fight anyone and I wasn't about to duck my mandatory, no matter how dangerous." Crolla, who won the title in November 2015 by stopping Colombia's Darleys Perez, says champions have an obligation to take on the top challengers. "He's been swerved and avoided, but when you are the champion it's your responsibility to fight the best opponents out there, and he fits the bill," he said. Barroso is the bookmakers' favourite for the fight, but Crolla says he has "thrived" when cast as the underdog throughout his career. "It's not often the world champion is the underdog when he defends a title," he said. 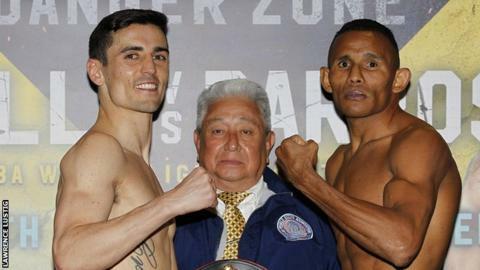 At Friday's weigh-in, Crolla came in at nine stone, eight pounds and five ounces, while Barroso weighed two ounces less.